On our first full day in Puerto Rico (Sunday, 15 January), Mike and I decided to start in the east of the island and work our way west. After a short night’s sleep at our hotel just outside of Caguas we took the half-hour drive to Humacao and arrived shortly after dawn. Though the preserve doesn’t officially open until later in the morning you can access it before opening hours by walking the path on the other side of the canal from the entrance. We had high hopes for our first morning’s birding with our main goals being the two hummingbirds that are most easily found in the east, the Antillean Crested Hummingbird and the Green-throated Carib. While neither is an endemic they are two of the five hummingbird species found in Puerto Rico and we wanted to make sure to see them, mostly for Mike’s sake as I had seen both in Culebra last year. 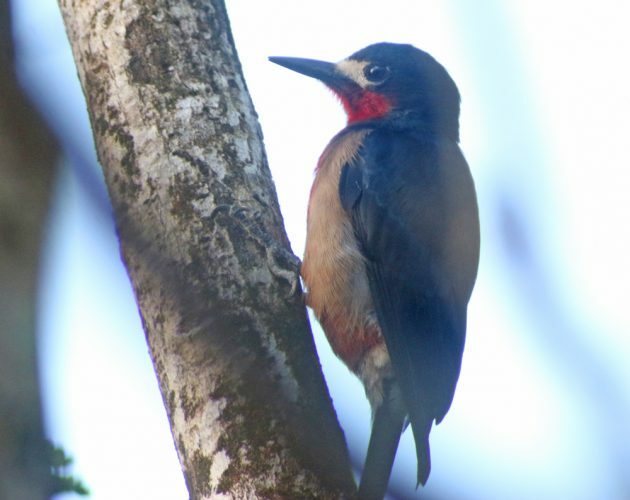 We also hoped to start seeing some of the easier endemics and had made our best guess as to which would be our first. I was convinced that we would get a Puerto Rican Tody as our first endemic species while Mike was sure it would be a Puerto Rican Woodpecker. In the event, neither of us was correct as a Puerto Rican Flycatcher ended up being the first endemic to cross our field of view. This Myiarchus flycatcher is typical of the genus though with a much more muted palette, appearing pretty much gray-and-white in the shadows of the canopy. Though not the most exciting of species to start our endemic list with it was still a species neither of us had ever seen before and we were pretty stoked to see it. This Puerto Rican Woodpecker was our second sighting of an endemic for the day. We spent awhile scanning the lagoons and were rewarded for our efforts with a host of Ruddy Ducks, a pair of Blue-winged Teal, lots of Common Gallinules and a bunch of American Coots which would have been a lot more exciting if they were still Caribbean Coots. Curse the lumpers who stole species status from the white-shielded Caribbean race of coot! 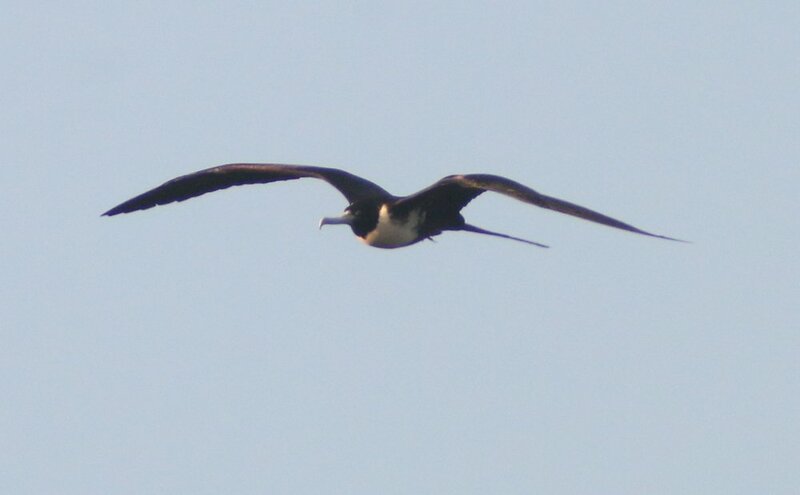 It was also nice to see a Magnificent Frigatebird soar overhead and it really paid keeping our eyes to the skies as later in the morning when Mike spotted another frigatebird and we raised our bins to watch it he also spotted a Caribbean Martin up there which ended up being our only one of the trip. I shall never grow tired of being in places with Man-O-War Birds. Such awesome creatures. After the lagoons we took the long loop that parallels the coast without seeing too terribly much, though our first encounter with Green-throated Carib was nice when Mike spotted one perched directly above the trail. Mike was also pleased to see his first ever Pearly-eyed Thrasher. This picture of the Green-throated Carib is kind of gross but it was the best shot I got. Low light does not help when digiscoping. Eventually we made our way out to the beach where not much was going on except for the occasional Brown Pelican. The breeze off the ocean was refreshing after the stifling heat under the trees. 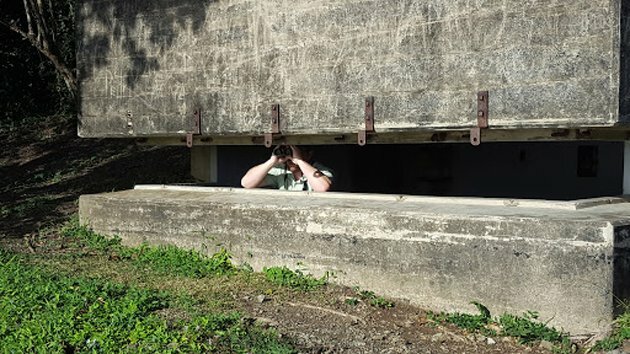 We walked back on the path closer to the beach without seeing too much and made our way up the small hill where we found bunkers you could climb down into. How could I resist? …and then realized that what I was hearing wasn’t Mike’s gastronomic distress but a tody! Mike got on it first and after a frantic minute or so I finally spotted it as well. PUERTO RICAN TODY! For the record, todies are awesome even though this one didn’t sit still and let me get a picture. Still, it was such an amazing, stubby, little creature: brilliant green, startling red, and crisp white, with a long, broad bill that looked like it belonged to a much larger bird. It would be tough to top a tody but we did our best, exploring a good chunk of the preserve and netting ourselves some wintering wood-warblers like Magnolia Warbler, American Redstart and the seemingly-always-present Northern Waterthrush. 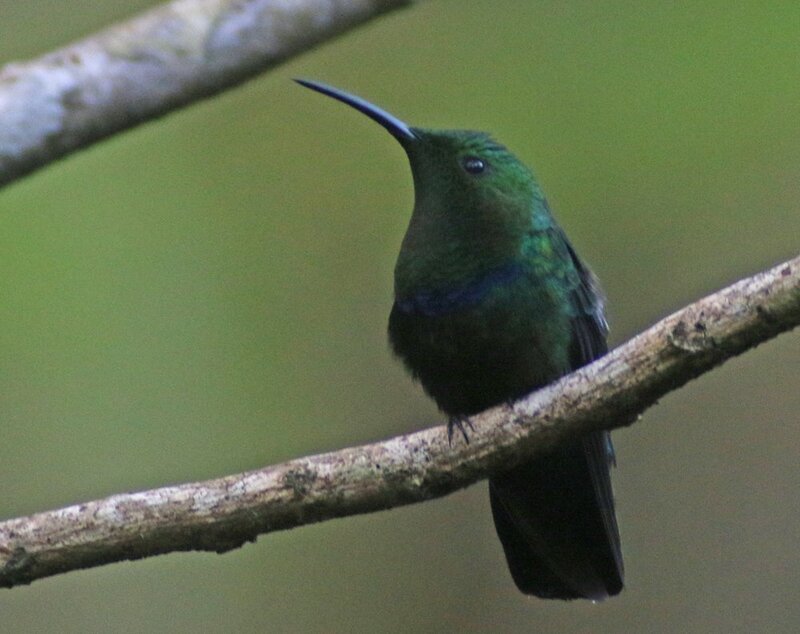 Once we had finished our route through the preserve and were back at the car we realized that we still didn’t have an Antillean Crested Hummingbird. The best site for this bird was further north and east in Fajardo but there were plenty of blooming trees at Humacao and rather than get further away from our day’s destination we decided to do another loop around Humacao and hope for the hummingbird. We failed. But we did get absolutely amazing looks at some Mangrove Cuckoos! 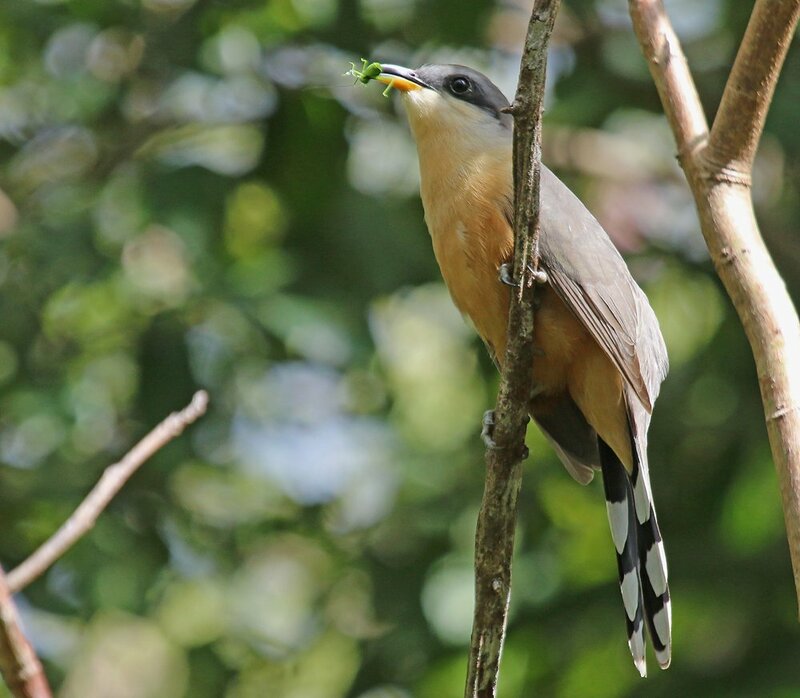 As a consolation prize you can certainly do worse than a point blank Mangrove Cuckoo. Though we were not happy about missing one of our two hummingbird targets we eventually decided that we had to move on so we could get to our next birding destination, the dry forest of Guanica way over in the southwest of the island, which would be our base for the next two days. An additional consolation prize as we waited at a red light before getting on the highway was a flock of Orange-cheeked Waxbills, an introduced species that we would not see again for the rest of the trip! If you want to see our checklists from eBird for the morning you can see them here, here, and here. 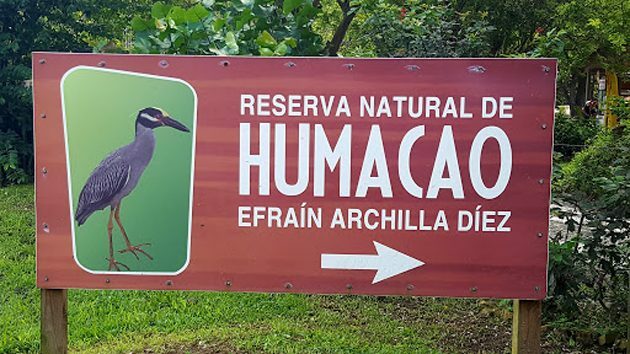 Humacao Nature Reserve is a marvelous spot to bird, has nice pavilions for picnics, a concession stand with a limited inventory (though you can get coffee and cold drinks), and it seems to be a popular place for renting bikes and kayaks. Whether you are a hard-core birder or a family out for a nature walk I think you will enjoy visiting. By the time we left the reserve was pretty busy with locals and tourists out walking and enjoying the surroundings. 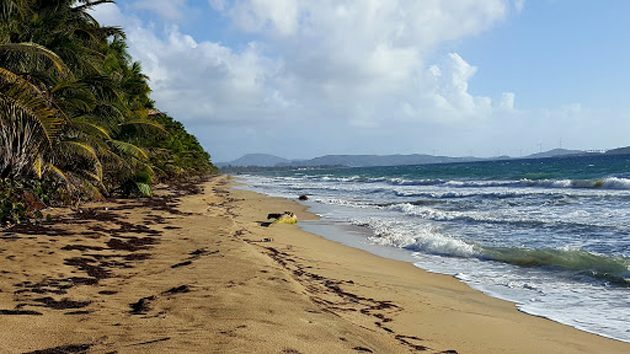 This is the first in a series of posts about Mike and Corey’s self-guided trip to Puerto Rico from 14-18 January 2017. Make sure to come back soon for the next installment. Nice post, but why did the reserve have to choose a bird as their Symbol that doesn’t exist? 🙂 Come on, Corey, you knew I just HAD to comment on this! Love all of this, but most especially the whisker-thin toes on that tiny Green-throated Carib. Could it be any cuter?! Nice post. Those two hummingbirds are the common ones just to the west, on St. John in the US Virgin Islands. I saw lots of them on our honeymoon there a few years back.